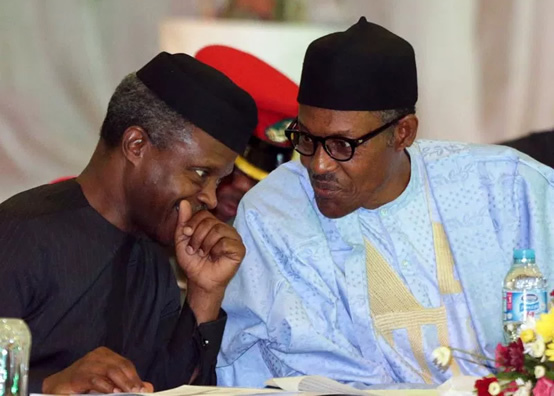 If Vice President Yemi Osinbajo expected a public outrage at his latest revelation that the whopping sums of N100 billion and $289 million were embezzled by the Goodluck Jonathan administration weeks to the 2015 elections, he must be disappointed by now. Up till now, nobody is exactly asking for Jonathan’s head on a spike. Osinbajo has confirmed people’s suspicion: that Buhari, the man who was elected to tear down the temple of corruption in Nigeria is not as potent a force as he was marketed. Nigerians that thought they were getting two raging bulls must be wondering how they ended up with these hand-wringing jokers. Osinbajo should not be surprised at the yawns and wrinkled noses he got from Nigerians for his exposé, people now think that still blaming Jonathan is an old subterfuge considering everything else that has befallen us under Buhari. If Jonathan and his merry band stole so much and up till now, the best you do is throw out repetitive lines of how much he stole; maybe you should not be in government. Nigerians voted you to fight corruption, not to join them to moan about it. This day three years ago, it was five days before the presidential elections. Everywhere you turned at that time, you heard “Sai Baba” chanted to the tune of “anti-corruption.” Followers of the candidate and now President, Muhammadu Buhari, evangelized about the coming of this messiah whose no-nonsense stance will cleanse Nigeria’s Augean stables for good. Even his former foes forgave him without him asking. Buhari himself, aware of the weight of expectations imposed on him, sold himself as the karma of corruption in Nigeria. Everywhere he went, he sang about fighting corruption and Nigerians rocked themselves to its sonic sensation. When Buhari was first sworn in, bragging about what Jonathan’s administration had done wrong was the most priced and bestselling share on the stock market, and the APC — still basking in the euphoria of unexpected victory — made huge dividends out of it. Almost three years after he was sworn in, the folks who rhapsodized about Buhari’s anti-corruption agenda have found that he was no different from his predecessor. He is just as clueless, and corruption — Nigeria’s Frankenstein monster — has once again swallowed another one of its creators. Post-2015 Nigeria is still in the doldrums of ineptitude, nepotism, tribalism, and uncontained violence. Osinbajo is still talking about what Jonathan did wrong when their government has barely been able to do a single thing convincingly right. Osinbajo was also quoted as saying that at some point, those who promoted strategic alliance contracts between the NNPC and the NDPC made away with almost one-tenth of our national reserves! That is a mind-boggling amount. Such a theft ought to be thoroughly investigated and punished, and not just crunched into a sensational speech at an occasion. Osinbajo, again, said that it was only in talking about such mega-thefts that we could resolve such thieving. True, he has a point that such scams need to be addressed, but he seems to forget that talking is all Buhari’s government has done till now. People are tired of accusations; they are tiring and demoralizing. What we want to see is what the government under his watch has done about such embezzlements. How many of those people have been tried and how many are on their way to jail now? If nothing of the sort has been done, then what is the point of informing us who stole what? You are only confirming that you are weak, and your government is more or less a paper tiger. Mentioning Jonathan’s name alone used to be a potent means of whipping Nigerians into frenzied outrage about “corruption,” but people seem to be fatigued about the unending talk of what is wrong; they want transparency, reforms, and action. They are bored with people like Osinbajo constantly revving the engine of a vehicle that has no wheels. Not only are officials of this administration adept at just talk, they, in fact, act as a striptease. Just a few days ago, the Chairman of the Presidential Advisory Committee Against Corruption, Prof. Itse Sagay (SAN), also said that if he released details of the allowances of the principal officers of the National Assembly, Nigerians would be shocked. But what exactly would be shocking to Nigerians about his revelations considering that Sagay already informed Nigerians last year that lawmakers earned as much as N29m monthly? What else is “shockable” about what he has to reveal? At worst, he will reveal that Senate President, Bukola Saraki possibly earns N1bn monthly. Even if we find out that things are that sordid, what exactly is the reaction he expects the shock we will experience to solve? Sagay thinks Nigeria will explode if people find out what the lawmakers cost them but most people know, just like they know that Buhari’s budget is just as padded as was his predecessors’. They just insist on keeping their sanity intact by ignoring their thieving leaders. I think Sagay — much like Peter Obi who also teased us with information about what governors earn — is overestimating the capability of Nigerians to be still shocked with the mindless looting that goes on in the country every day. Nigerians have come to realize that both the APC and the PDP are bad for their mental and moral health, and there is nothing one side can accuse the other of that it is not guilty of too. That is why Osinbajo’s revelation did not get much more than sneers and jeers. He is working in an administration whose anti-corruption agenda has become more or less reduced to accusations and counter-accusations, and he wants us to be moved by Jonathan’s profligacy. Since Buhari became president, his cronies too have been accused of corruption, seven million people have lost their jobs between 2016 and 2017, and Nigerians have yet to recover from the effects of a recession. Think of the degree of violence that has occurred under Buhari, from the killings in Benue to Kaduna, Enugu, Taraba, and the abduction of girls in Dapchi. How about those for “shock” and explosion? If the country did not go on the streets to protest after Buhari spent half of last year abroad, and up till now he has still not accounted for how much his health cost the country, then what is Sagay worried about? There is every possibility that Osinbajo is right that Jonathan plundered the nation for his re-election. All the money Jonathan’s administration spent in 2015, particularly in the last few weeks of the election when he was crawling on his knees from churches to traditional rulers must have come from somewhere other than his pocket. But Osinbajo will not get the reaction he expects from Nigerians this time because Buhari himself has not shown superior morals when it comes to the issue of dipping your hands into the national pockets. 1n 2015, Buhari did not finance his campaign with five loaves and two fishes. The money too came from somewhere, and we know it was not his putatively untainted pockets. In fact, Buhari has that mystique about him: he has a way of making people believe he is personally not corrupt even though whenever he has needed money to finance his ambition, somebody’s dirty hands have picked up the invoice. Up till now, nobody in the APC has had the honour or dignity to account for their campaign spending yet they cry about others’ faults. By 2019, they are likely to do exactly what they accuse Jonathan of: take money out of the national reserves to finance their campaigns too. That is why their moral posturing moves nobody whose head on his/her shoulders can think their way out of a paper bag.